Local 98 boss John Dougherty was charged Wednesday in a indictment that also ensnared City Councilman Bobby Henon. 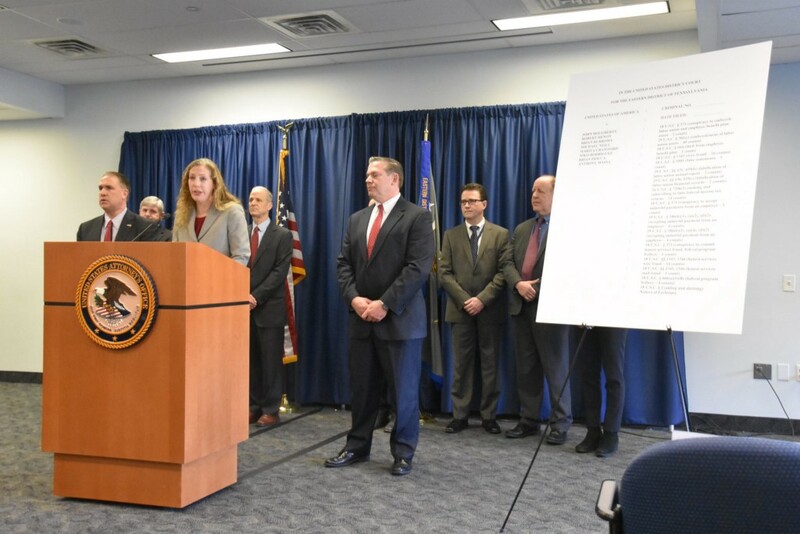 Federal authorities on Wednesday, Jan. 30, announced criminal charges against union boss John Dougherty, Sixth District City Councilman Bobby Henon and six other people connected to the International Brotherhood of Electrical Workers Local 98. Prosecutors said Henon did Dougherty’s bidding, in one case even stepping in to try to halt the installation of MRI machines at Children’s Hospital of Philadelphia because the work was being done by the manufacturer, and not union electricians. Henon, who lives in East Torresdale, is facing 20 counts of bribery and fraud, while Dougherty, Local 98’s business manager and a South Philadelphia resident, was charged with more than 90 counts of embezzlement, fraud, bribery and other crimes. First Assistant U.S. Attorney Jennifer Arbittier Williams said the pair could each spend decades behind bars if convicted of all charges. Both men have denied the allegations. A key part of the case against Henon is his role as a paid employee of Local 98. Henon received an annual salary of more than $70,000 from the union in 2015 and 2016 while he was serving as a councilman, according to the 165-page indictment. Prosecutors allege Dougherty asked Henon in July 2015 to complain to the city Department of Licenses & Inspections about MRI machines being installed at CHOP. The indictment states the hospital was having the manufacturer install the equipment in order to receive a warranty. L&I employees inspected the job and issued a preliminary stop work order, according to the indictment. Later, the department denied to issue a certificate of occupancy to CHOP for the room that was under construction. In another instance in the indictment, prosecutors said Dougherty warned Henon not to finalize a city agreement with Comcast unless the cable company hired MJK Electric, Dougherty’s favorite contractor. Dougherty reportedly told Henon in November 2015: “That is why you are over there, that is why we raised 600 grand, that is why we did the deal… for one reason — to put you on public property to fight like a giant,” referencing City Council’s Committee for Public Property and Public Works. Ultimately, Henon and Dougherty shook down Comcast to steer more than $1 million in work to MJK Electric, the indictment says. MJK is owned by George Peltz, who has already reportedly pleaded guilty in a related federal case. In addition, the indictment claims that Henon and Dougherty in 2015 conspired to help pass the city’s soda tax as a way to hurt the Teamsters Union, which had just run an advertisement criticizing Dougherty. Prosecutors also allege Henon opposed an audit of the Philadelphia Parking Authority in exchange for $3,105 in material for work at a friend’s house, and delayed legislation on a new plumbing code to help Dougherty be elected head of the Philadelphia Building Trades Council. “In essence, the indictment alleges that Henon abdicated his duty to provide honest services to the citizens of Philadelphia because he made decisions on behalf of John Dougherty, rather than the people who elected him to City Council,” Arbittier Williams said at a news conference. The wide-ranging indictment also includes allegations that Dougherty and his associates stole thousands of dollars from Local 98 accounts for personal use and to help family members and friends. Prosecutors allege Dougherty and the other Local 98 officials embezzled more than $600,000 from the union and its training program and falsified expense and tax records. FBI Special Agent Michael Harpster, who leads the agency’s Philadelphia division, stressed that the case is not against Local 98. Rather, the union’s members are the real victims, Harpster said, and he urged them to read the indictment. Dougherty’s attorney Henry Hockeimer released a statement defending the union boss, who has led Local 98 since 1993. Dougherty, Henon and the others who were charged in the indictment are scheduled to appear in federal court Friday afternoon. Arbittier Williams said the U.S. Attorney’s Office intends to try all eight defendants together. She also said the probe that led to the charges is ongoing, but declined to comment on whether any other city lawmakers or officials are under investigation.